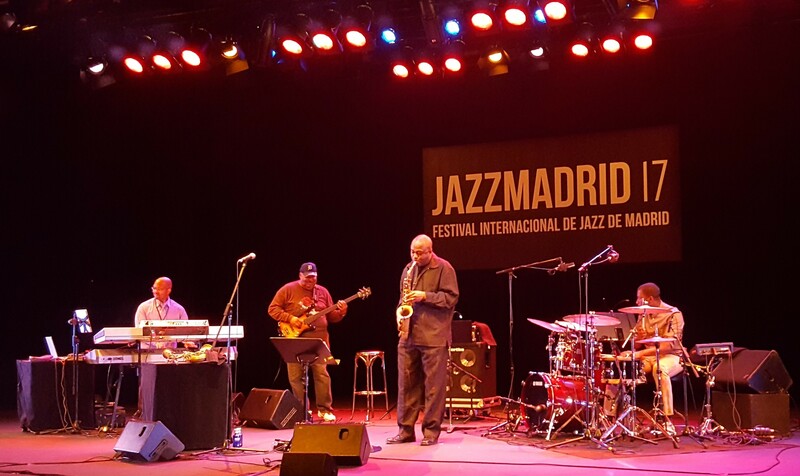 Saxophonist James Carter hasn’t performed in Madrid for a while and as I had been working with him on his Emarcy records, I was looking forward to see him again and with a new project entitled Elektrik Outlet. This new group features keyboarder Gerard Gibbs, who has so effectively played the organ in James’ previous trio, Ralphe Armstrong on bass and Alex White on drums. Wednesdays show was only the second gig of this group, which uses electronic effects to enhance their sounds and grooves, as this is truly a more funk based project that any other James did before. These guys can definitely groove – Carter blowing so hard that at one point he lost the mic on the soprano sax and just stepped closer to the audience and continued to play and we could still hear him well over the infectious bass grooves and drum shots. James has this incredible technical ability and uses it perfectly to fit the songs.. with the grooves of the trio behind him he could showcase his incredible circular breathing and spectacular sax runs …keeping it in the song and pushing his band to further limits … once these guys have played a few more gigs, this is going to be one hot show – it was already great here in Madrid, but I am sure there will be more to come. Not to be missed!!! The Fred Hersch Trio with Hersch on piano, John Hebert on bass and Eric McPherson on drums has been playing together for many years now and have developed an almost telepathic way to communicate while playing together – which makes the music-making look and feel very easy and light, despite the difficulty of the compositions presented here. The majority of these were by Fred Hersch, from which for me the tribute he composed for British pianist John Taylor was the most touching. Like on their last trio album ‘Sunday Night at the Vanguard’, the guys performed Paul McCartneys ‘For No One’ and Monks ‘We See’ perfectly. The Trio’s playing almost feels understated, there is no showing off in any form and maybe because of that the music is so emotional and touching. The solo encore Hersch gave the thankful audience, alone would have been worth attending this show: a beautiful ballad whose emotional content brought tears to the eyes of the people sitting next to me. If music can create such strong emotions, it is at its best. Saxophonist Melissa Aldana is growing in stature in the jazz world and rightly so: the show with her quartet featuring Sam Harris on piano, Pablo Menares on bass and Craig Weinrib on drums was energetic, intense and a great example in modern jazz improvising, as the group perfectly supported Aldana in her sax excursions with free playing, but always checking what her leader was up to, so musical context could be created. Outstanding her solo intro to ‘I Loves You Porgy’, which then the group performed beautifully. All in all a great show, which could have even been better if the drums wouldn’t have been too much upfront in the mix, making it sometimes hard to hear the exciting piano runs by Sam Harris. Now that’s what I call a power trio: Chris Potter on saxes, sounds, samples, loops and electronics, Reuben Rogers on electric bass and Eric Harland on drums! !Starting their show with an extended version of The Police’s Synchronicity was a statement as such – this is modern jazz and we can take any starting point and then move freely around in the song to express what we want to communicate to our audience! Potter, using electronic and loops to empower his sound and use different colours within each song, played with a seldom heard intensity and bass and drums powered him to further impressive soloing when needed, or simply and sensitively supported his ideas. 5 compositions performed in a show of over 90 minutes …freedom to play around within a song, to go to new places and find new expressions as a group is an important part of this music, which only can be achieved by true masters of their instruments and musicians with an understanding for each other. Potter + Rogers + Harland = an amazing musical adventure of the highest level. Truly stunning music making and another contender for jazz gig of the year!! One of the shows I was looking forward to within the excellent program of this year’s festival was Bill Frisell: Music For Strings. Frisell, in musical partnership with long time collaborators Jenny Scheinman on violin, Eyvind Kang on viola and Hank Roberts on cello, re-visited gems from his own catalogue plus other compositions, notably Burt Bacharach and the theme to the TV show Bonanza, which ended the concert as second encore. The 4 musicians drifted between arrangements that felt more Americana and some like contemporary classical pieces, never forgetting the beauty of the basic melody in each tune. 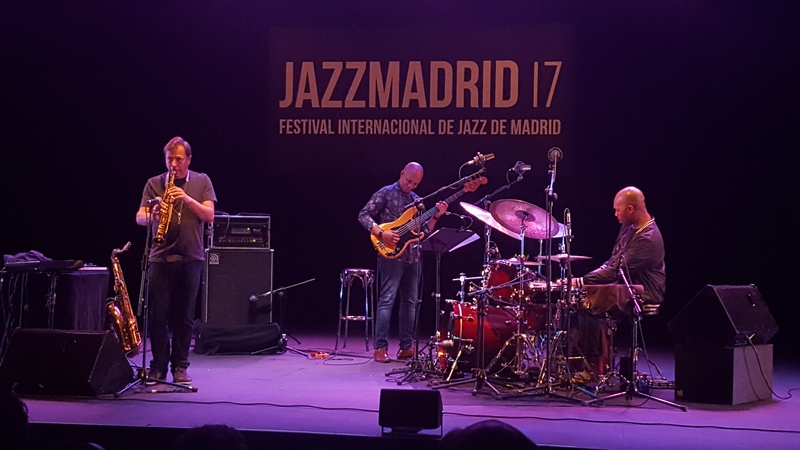 The concert again showed how great Frisell’s compositions are and that they can shine, no matter what instrumentation he decides upon. In this case Scheinman, Kang and Roberts were the perfect partners and created a laid back atmosphere to enjoy this great music. A deserved standing ovation showed the appreciation of Frisell’s art by the audience. The concert of John Medeski’s Mad Skillet on Sunday, November 12th, could be described as ‘Sun Ra visits New Orleans’, as the quartet with Medeski on piano and organ, Will Bernard on guitar, Kirk Joseph on tuba and Julian Addison on drums, grooved their way through some impressive originals that the band has recorded for their forthcoming new album, as well as ‘Golden Lady’ by Sun Ra, which completely fitted in with the rest of this psychedelic groove gig. Medeski is a master on the Hammond B3 and the rest of the gang did some great soloing as well were extremely tight as a group. Couldn’t keep my feet still ….. this is going to be one hell of a festival act!! After New Orleans, the next gig took me on Tuesday night to Memphis, birth place of the unique singer Dee Dee Bridgewater. Dee Dee brought the Memphis Soulphony with her to perform songs from her new album ‘Memphis…Yes, I am ready’ and did so in style! Dee Dee is probably one of the greatest singers of our time – whether she does Jazz or Soul – it doesn’t matter – she makes the songs her own and delivers without fail. This project is a step back into her teenage years and the music she listened to then, but putting her own stamp on these compositions. One of the many highlights of the 2 hours show was Pops Staples ‘Why (Am I Treated So Bad)’ with an explanation of the roots of this song and a performance that was full of emotion and power. The band with Farindell Smith on keyboards and organ, Barry Campbell on bass, Charlton Johnson on guitar, Carlos Sargent on drums, Curtis Pulliam on trumpet, Bryant Lockhart on saxes, as well as singers Monet Owens and Shontelle Norman was absolutely incredible and helped Dee Dee to deliver her vocals on the highest level. Her story telling between the songs was interesting and funny, but maybe for some of the audience, which didn’t understand English, a bit too much. All i9n all one of the best shows of the year – Dee is still on tour with this program for a while – don’t miss it!!! Comes fall, comes the Jazz Festival season and in Madrid the festival this year started on November 2nd … but just before the festival got under way I went to the concert of the Norwegian World Orchestra, which did perform for 2 days in town. Lead by Javid Afsari Rad this 10 piece orchestra is a reflection of our world: 10 musicians from 4 continents; 8 countries and their cultures mixed into one sound, one idea of expression. Here music shows what politics is missing: communication on a human level, common expression for the love of life and compromise and understanding. The orchestra on the night I saw featured beside Rad, who plays the santur, saxophonist Trygve Seim, violinists Harpreet Bansal and Sara Ovinge, Andres Maurette O’Brien on viola, Adrian Fiskum Myhr on double bass, Solo Cissokho on cora and vocals, Aissa Tobi on sinter, rabab and vocals, Jai Shankhar on tablas and Habib Meftah Boushehri on percussion. Each musician and instrument contributed to the universal sound and beauty of the music, which had a flow and lightness to it that is difficult to achieve. From duos to the full orchestra playing, the music never stopped to cross borders and engage the listener – global expressions of the highest kind. A flicker of humanity in a crazy world. Gilad Hekselman is one of the leading young guitarist around today and his trio with Rick Rosato on bass and Jonathan Pinson on drums, a great band to hear live. Add to that the amazing saxophone of Mark Turner and you are in for a night of great jazz. 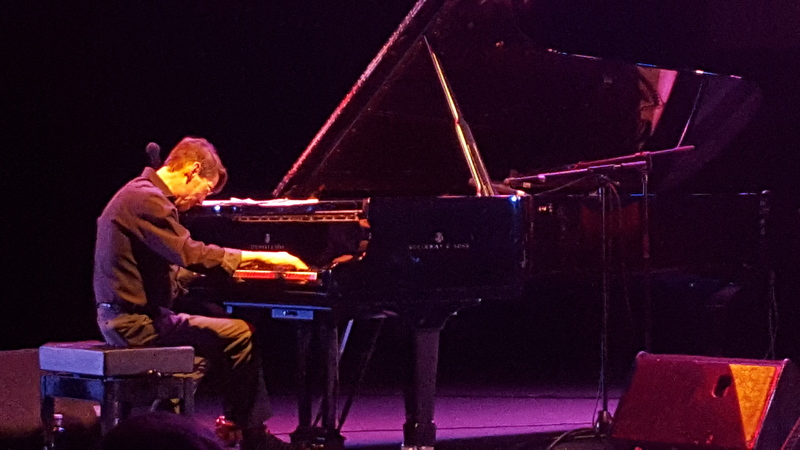 Hekselman’s compositions are beautiful and clear, as is his playing and his understanding with Turner, who adds some deepness to an already great band. The communication between the sax and the guitar is truly special, as is the support the bass and drums are providing. The musicians seemed to have fun on stage and the audience was enjoying the show as well, as a standing ovation highlighted. Clap Clap was not only the name of one of Gilad’s great compositions performed that night, but as well the sound of the audience after each song. I have kind of a soft spot for Becca Stevens: her song writing is simply amazing and her vocal performance in a league of her own. 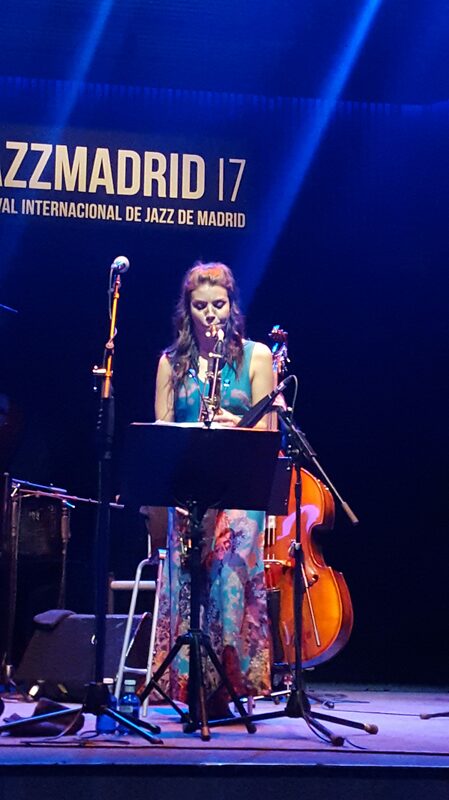 Her show in Madrid, featuring Alicyn Yaffee on bass and backing vocals and Jordan Perlson on drums, featured songs from her album ‘Perfect Animal’ and of course of her latest release ‘Regina’ and again showed what an excellent singer she is – her songs are not easy pop songs, but compositions of fine art and touching and with excellent lyrics. And even when she is performing someone else’s songs (like Stevie Wonder’s Always) it sounds like it is one of hers, she makes in completely her own with her phrasing and arrangement. The audience had a great time listening, sometimes singing along and in the end asking for 2 encores! Becca Stevens is an artist on the rise and deservedly so. Kasia Pietrzko / Forthright Stories – still in her early 20s, this young Polish pianist and composer has a lot to offer – cool ideas in her songs and fantastic playing with her trio, as well a beautiful song with added cello (Zielone Oczy Grafitowe). One to keep an eye on! Swiss singer Yael Miller released a self-titled 5 song EP, which is definitely worth checking out. Simple and modern in the arrangements, this music doesn’t fit into any genre, but nevertheless is great: well written music with great lyrics and perfectly performed. Check her out. Can’t wait for the first full album of her! In 1995 Wolfgang Puschnig released the acclaimed album Mixed Metaphors, which just was re-issued. The recording features a singer, a poet and a rapper to perform their vocal skills over groovy and touching jazz composition by the Austrian sax player and features Jamaaladeen Tacuma on bass, Questlove on drums, Rick Iannacone and the Andy Manndorff on guitars and Milton Cardona on percussion. The vocal parts are performed by Linda Sharrock, rapper Antoine ‘Bun’ Green and poet Ernst Jandl. A unique album then, the re-issue just shows how timeless this music is.